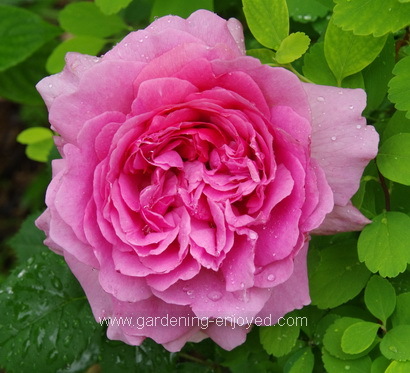 Dallying In The Dirt, Issue #295 - These Oso Easy Roses certainly live up to their name. Something pretty in the garden usually gets to be the first picture but not this week. You have to look closely to even see what the picture is showing you. 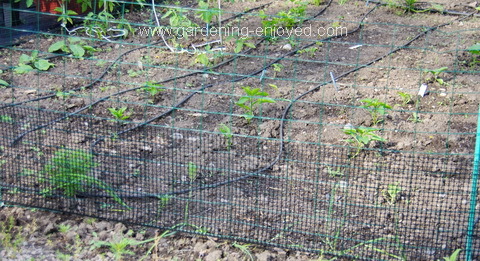 The taller green wire is my rabbit fence around the veggie garden. Last week I was quite dismayed, to be polite, to discover a couple of mid sized rabbits inside that fence dining on my Brussel Sprouts. How could that be? As I approached they hopped over to the fence and amazingly were able to contort their bodies to squeeze through the 2" x 3" rectangles that make up that fence. I stood and stared in disbelief as they put their front legs out then tucked in their heads and somehow compressed and elongated their bodies and were on the other side and this was not a slow process it happened faster than you can read about it. Now what do I do? Eventually they might too big for that little trick but they are going to grow by eating my vegetables. Off to the fence store I went. On the bottom of the fence you can now see the 12" high black mesh that they cannot?? get through and hopefully not over. I chose not to make the fence from this material originally because it is black and dense and too visibly obvious in the garden. Good looking or rabbit proof was my choice but of course it never occurred to me that the less obvious green wire wasn’t rabbit proof. We do learn something new in the garden everyday and we can only hope that it will be a pleasant surprise most of the time. I’m inside writing “Dallying” even though it’s a bright sunny day and it is the longest day of the year. It rained at least 5 times yesterday and as I look out the window it is a pretty picture as all of the garden is covered in glistening water droplets. While that is beautiful it also greatly limits what activities I can undertake. The sun will dry it off shortly and I can get back out to appreciate the delights and pull some weeds. Up against the south facing wall of the solarium, growing in a narrow, rather gravelly strip and competing with the Sedum groundcover is this amazing Rose. This is one of the many new Rose types that are being developed. It’s one of the Oso Easy Roses. It has been there for a few years being one of the original varieties in that series. I have long since lost the name but I think it’s Cherry Pie. 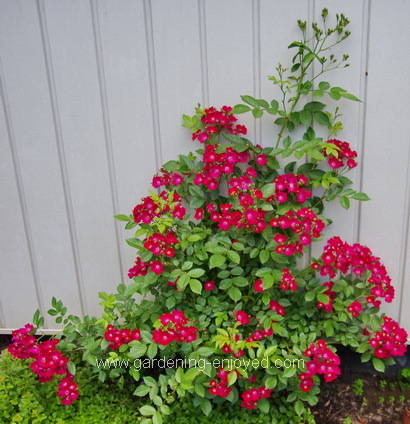 It just flowers all summer without any deadheading or diseases in a very tough location. I occasionally deadhead it by cutting off the large clusters of spent flowers but I do this to keep it relatively small, it would continue to flower even if I didn’t. It is quite thorny and hangs over a narrow path where it could snag passers by if was allowed to get too large. If I’m fertilizing the nearby containers I will occasionally toss a bit in its direction but it seems to thrive and bloom continuously no matter what I do. It has very little winter die back so I do cut it back a bit in the spring just for shape. There are several other Oso Easy varieties available that you can plant sit back and enjoy. The Rabbits don’t eat them. Rabbits, I do seem a bit obsessed don’t I, don’t like Tomatoes and they don’t like to stand up and eat from my sub-irrigation containers so they are not inside the fenced area. This is the first year at adapting my tomato structure to be used in conjunction with those containers and they are thriving as you can see from the picture. 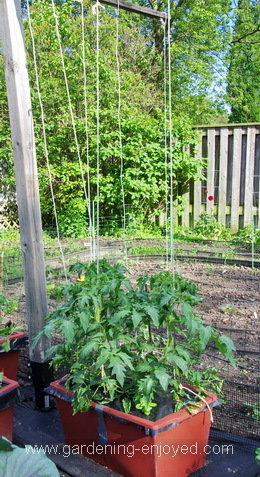 Pruning to one stem and winding around the ropes is a weekly chore that takes a few minutes. I have had trouble with some Tomatoes for the last couple of years and it appears to be diseases that are soil borne. By using a sterile soilless mix in those containers I hope to avoid the problem. Things just grow so much more vigorously in them that I anticipate a great Tomato crop. At this point in the season they are looking great and growing at rapid clip. Many things are thriving in this cool wet spring that we are experiencing including my Roses and in particular the several David Austin varieties. Of course, they are bred in England where the weather is??? This is Princess Alexandra of Kent and she is in a less than ideal location as you can see from the Spiraea foliage in her background. There is much competition in her location and less than a full day of sun. I was going to move her this spring but that’s one of the many jobs that got postponed because of the weather. She has responded beautifully as you can see. That gives me a whole summer to contemplate a better location for her, she certainly deserves one when she produces blooms like this whose beauty can drive all thoughts of bunnies from my brain. Carol Asks? Is it the cucumber beatle that makes a lacey looking leaf or just leaves a stem? Somethings ate the turnip tops , some pole bean leaves , dailya leaves , zinnias? Is there something I can do? Desperate!! Ken Answers! Yes, the lacy leaves of cucumber and zucchini are the result of the cucumber beetle. The other edibles, if they are completely eaten, is probably the result of rabbits. Fencing is the only good solution. I'm still looking for solution to cucumber beetle other than going out each morning and crunching as many as I can. Tom Asks?Help!! I'm at the end of my rope with these moles...voles...mice...whatever. They've almost cleaned me out of about $100 worth of nursery plants. They're in my raised beds and have already eaten my snapdragons, dill, some lupins and lillies. What to do?? I've tried sprinkling cayenne pepper, no luck. Then I tried crushed chile peppers... again, I think they're into spicy food!! I've caught 2 in mousetraps using cheese. They didn't go for the peanut butter or cheese whiz. I'm about to buy rat poison, but is there anything else you can think of?